Wood boring beetles are a well-known group that causes significant ecological and economic impacts to forests. The cost of annual losses to forest-derived products attributed to introductions of non-native insect species into the U.S. is estimated at ~$2.1 billion per year (Pimentel et al., 2005). Anoplophora glabripennis (Asian Longhorned Beetle, ALB; Cerambycidae), was first detected in the U.S. in 1996. Nowak et al. (2001) estimated the potential effects through time of this pest on urban resources to be a loss of 35% total canopy cover, 30% tree mortality (1.2 billion trees), and value loss of $669 billion. Since its introduction into the U.S. in 2002, the northeastern Chinese native Agrilus planipennis (Emerald Ash Borer, EAB; Buprestidae) has killed millions of ash trees in the U.S. and Canada and threatens the $280 billion ash resources in North America (NPB-Resolution 4, 2005). 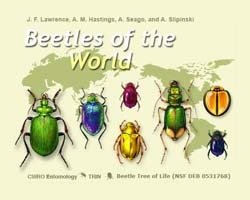 A Resource for Wood Boring Beetles of the World provides a front end to allow Plant Protection and Quarantine (PPQ) and cooperators to easily locate the appropriate digital tools and aids they require to assist them with the identification of these economically important pests.